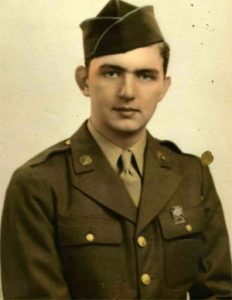 Donald John Loeffler of Culpeper, Virginia, born on June 22, 1926, went to be with our Lord Jesus on Saturday, March 30, 2019. He was born to Celia and Phillip Loeffler in Scranton, PA, where he grew up and later met the love of his life. His wife, Joan Eleanor (Edwards) Loeffler, will miss her beloved husband of 74 years, and was by his side as he passed. Don went to Germany to fight in WWII while Joan carried their first child. Severely injured with a bullet wound to the belly, Don and Joan went on to raise their five children, work hard as a machinist in Washington DC for 30 years, then worked on vacation homes as a repairman on Hatteras Island, NC for 19 years. Don’s injury from the war reared up again in 2008 due to scar tissue and lack of blood supply to the area, yet he remained undaunted and active in his love for his wife and family. Don Loeffler’s five children: Don Loeffler, Jr., Nancy Quigley, Jeff and wife Denise Loeffler, David and wife Kathy Loeffler, and Gary and wife Janet Loeffler, along with his 11 grandchildren, 19 great-grandchildren, and a newly arrived two month old great-great granddaughter, know they are greatly blessed to have had this great man in their lives as long as they did. A private visitation for family only will be held on Thursday, April 4, from 10:30 to 11:00 am at Johnson Funeral Home, Locust Grove, followed by a public viewing at 11:00 am, and funeral service at noon, all being held at the same location. Interment will follow at 2:00 p.m. at Culpeper National Cemetery with ceremony and full military honors. Online guestbook is available at johnsoncares.com.